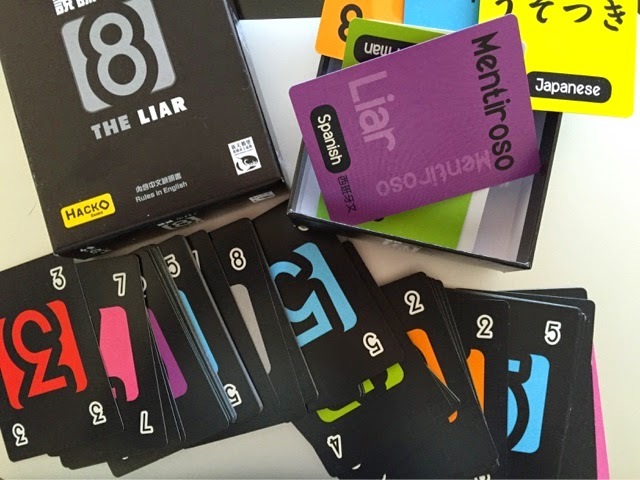 8 the Liar is a party style game that plays 2 - 8 players. In the game, players are trying to empty their hand of cards as well as 3 Liar chits they have before they can win. During your turn, you can play any number of cards from your hand, facedown into the center of the table. Before the next player plays his or her cards, anyone can challenge you by placing their Liar chit down. Whoever loses the challenge will have to pick up ALL the cards on the table. If the challenger was correct, then the Liar chit is discarded. Play continues until one player has won. When we first started playing, all of us were quite excited and intrigued. We do like good party games and the group I was with especially liked bluffing elements in games. We quickly realized that discarding cards was easy, getting rid of the liar chits is difficult. This is made even more difficult because we have so many players so really knowing when each other is lying is crucial. Unfortunately though, this game seems to drag on for way too long. Initially we were laughing at people that had to grab a lot of cards but once everyone started to try to get rid of their liar chits it started to stagnant. Cards will often flow from one to another and it was getting too difficult to get rid of the liar chits. In the end we decided to call it (after about 30 minutes of play) because we had enough of the to-ing and fro-ing of the big stack of cards. Granted that the table is cleared of cards if there are 8 on it and no one challenges. However with people playing large stacks of 8 or more cards and someone inevitably challenging in an attempt to get rid of their chits, that pile of card just keeps shuffling between players. There is also a bit of a slowdown in play when the player who just got that big stack had to rearrange their cards and then choose what to play. I think it may work better with 2-4 players instead of 8. I also think if the deck was trimmed depending on the number of players that may have made it tighter and more enjoyable without overextending its welcome. The cards are of nice card stock and the numbers are bright and artwork is good. It was interesting trying to pronounce 8 in the different languages. In summary, this game was a miss for me. The concept was interesting but perhaps needed one extra element as well as some streamlining to make it neat and elegant. Thanks to Swan Panasia for the review copy!